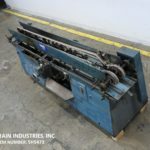 Mateer Burt, Model AU404 automatic, roll thru, hot glue wrap labeler. Container size range: 1¾" to 4½" in Diameter; 1(9/16)" to 7½" in Height. Label size range: 4-5/8" to 15" in Length; 1¼" to 7" in Width. Equipped with dual belt container handling, mechanical label magazine, hot glue pot with glue applicators, hot glue band lap seal and hand crank container adjustments. Speed dependant on materials, application and machine configuration. Mateer Burt, Model 704D, automatic, roll through hot glue labeler. Rated from 10 to 600 containers per minute – depending on materials, application and machine configuration. Container size range: 1¾" to 7¼" In Diameter; 1-9/16" to 10½" in Height. Label size range: 4-5/8" to 24" in Length; 1¼" to 9¼" in Width. Equipped with dual container handling gripper v-belts, hot glue pots with direct contact wheel applicators, single hydraulic label feed magazine, cold glue lap seal belt, no container / no glue, Control panel with heat on / off switch, start, pump. drive, digital thermostat heat controller, machine start, stop, e-stop push button controls. Mounted on heavy duty base frame. Designed to apply full wrap glue labels to cylindrically shaped containers of metal, plastic and glass with proper change parts. Mateer Burt, Model 704D MK V, automatic roll through glue labeler. Rated from 10 to 600 containers per minute – depending on materials, application and machine configuration. Container size range: 1¾" to 7¼" In Diameter; 1-9/16" to 10½" in Height. Label size range: 4-5/8" to 24" in Length; 1¼" to 9¼" in Width. Equipped with elevator infeed, dual container handling gripper v-belts, hot glue pots with direct contact wheel applicators, single hydraulic label feed magazine, no container / no glue, with start / stop push button controls. Mounted on base frame. Designed to apply full wrap glue labels to cylindrically shaped containers of metal, plastic and (glass with proper change parts). Mateer Burt, Model 704, automatic roll through glue labeler. Rated from 10 to 600 containers per minute – depending on materials, application and machine configuration. Container size range: 1¾" to 7¼" In Diameter; 1-9/16" to 10½" in Height. Label size range: 4-5/8" to 24" in Length; 1¼" to 9¼" in Width. Equipped with dual container handling gripper v-belts, hot glue pots with direct contact wheel applicators, single hydraulic label feed magazine, no container / no glue, with start / stop push button controls. Mounted on base frame. Designed to apply full wrap glue labels to cylindrically shaped containers of metal, plastic and (glass with proper change parts). Mateer Burt 408 automatic, roll through, glue labeler rated 10 to 600 containers per minute – depending on materials and application. Container size range: 1-3/4" to 4-1/2" In Diameter x 1-9/16" to 10-1/2" in Height. Label size range: 4-5/8" to 15" in Length x 1-1/4" to 9-1/4" in Width. Equipped with hydraulic lift label magazine, gripper V-belt, hot glue pot with direct container contact finger applicators and a second paste pot with direct belt label appliactors has machine and label feed start / stop push button controls. Right hand Labeler. Mateer Burt AU404 automatic, roll through wrap labeler rated 10 to 600 containers per minute – depending on materials and application. Container size range: 2-1/8" to 4-1/4" in diameter; 2" to 7-1/2" in Height. Equipped with single belt container handling, label magazine, hot glue pot with finger applicators, Valco lap seal system. Mounted on a height adjustable frame. Mateer Burt AU404 automatic, hot glue wrap labeler. Equipped with in feed elevator, single belt container handling, label magazine, hot glue pot with finger applicators, hand crank container adjustments, Valco lap seal system. Mounted on a height adjustable frame. Mateer Burt AU611 automatic, roll through, wrap around labeler. Label size: up to 9-1/2" in Width; up to 22" in Length. Container size: 2-1/8" to 6-11/16" in Diameter; 1-9/16’" to 7-1/2" in Height. Equipped with dual container belts, glue applicators, mechanical label magazine, lap seal and label compression section. Speeds from 10 to 600 cpm dependant on materials and application. Mounted on a height adjustable frame. Mateer Burt AU611 automatic, roll thru, hot glue, wrap around labeler rated 10 to 600 cpm – depending on materials and application. Label size: up to 9-1/2" in Width; up to 22" in Length. Container size range: 2-1/8" to 6-11/16" in Diameter; 1-9/16’" to 7-1/2" in Height. Equipped with dual container handling belts, label feed, hydraulic label magazine, hot glue pot with direct contact wheel applicators, Valco cold glue lap seal, hand crank container adjustments and variable temperature controls. Mounted on height adjustable legs. Designed to apply full-wrap labels to cylindrically shaped containers. Mateer Burt AU404 automatic, roll thru, hot glue wrap labeler. Container size range: 1-3/4" to 4-1/2" in Diameter; 1-9/16" to 14" in Height. Label size range: 4-5/8" to 15" in Length; 1-1/4" to 9-3/4" in Width. Equipped with dual belt container handling, mechanical label magazine, hot glue pot with glue applicators, Valco cold glue lap seal and hand crank container adjustments. Speed dependant on materials, application and machine configuration. Mateer Burt automatic, roll thru, hot glue wrap labeler rated 10 to 600 labels per minute – depending on materials and application. Container size range: 1-3/4" to 4-1/2" in Diameter; 1-9/16" to 14" in Height. Label size range: 4-5/8" to 15" in Length; 1-1/4" to 9-3/4" in Width. Equipped with dual belt container handling, mechanical label magazine, hot glue pot with glue applicators, and hand crank container adjustments. 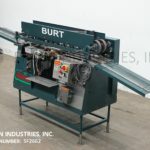 Mateer Burt, Model 704 automatic, roll through, glue labeler rated from 10 to 600 containers per minute – depending on materials and application. Container size range: 1-3/4" to 7-1/4" In Diameter; 1-9/16" to 10-1/2" in Height. Label size range: 4-5/8" to 24" in Length; 1-1/4" to 9-1/4" in Width. Equipped with gripper V-belts, single label feed magazine with mechanical adjustment, hot glue pot with direct contact finger applicators and cold glue belt lap seal, no container / no glue with start / stop push button and on /off glue pump switch controls with attached __" long in feed and discharge conveyors, with 38" infeed and discharge height. Mounted on (4) leg height adjustable frame. Designed to apply full wrap labels to cylindrically shaped containers, both metal and plastic containers also (glass with proper change parts).